Busy start to the holiday weekend for the members of Tower 2. On Friday at 230 pm the Paterson FD was sent to 21 Rose St for a possible fire. Companies arrived and reported a vacant house heavily involved extending into the exposures. Within minutes heavy very was consuming 3 homes and threatening others. A 2nd, 3rd, and 4th alarm were quickly struck. Tower 2 was requested to respond into the scene on the 4th alarm. Members were put to work operating hoselines in the exposures to knock down what fire was visible. Members returned home around 645 pm. 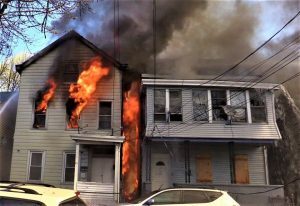 Paterson photos shown below courtesy of BNN and some of our members on scene. 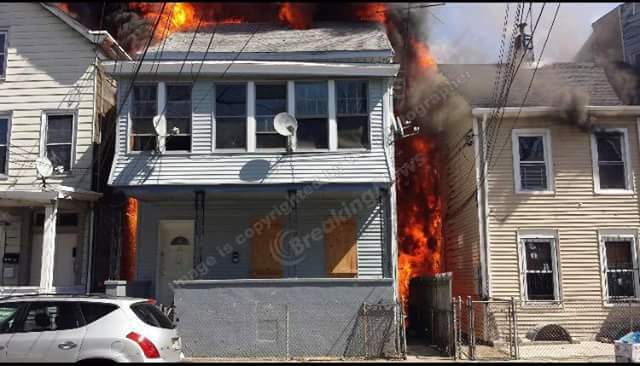 On Saturday shortly after 1pm Passaic FD was dispatched to 112 Gregory Ave for a reported fire in an apartment. Companies arrived and found heavy fire running the buildings cockloft and an apartment. 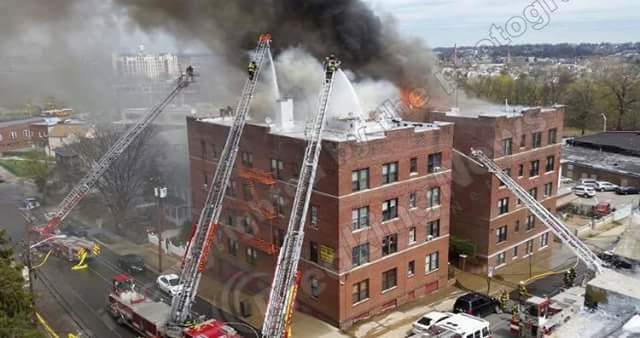 After an aggressive attack to try to knock down the fire companies were forced to back out of the building and off the roof due to fire conditions. At 1:50pm Tower 2 was requested to respond to cover Passaic at the Westside firehouse. After taking in multiple calls, Tower 2 along with North Haledon and Pompton Lakes engines were requested to the scene just before 630pm. Tower 2 arrived and was immediately put to work on the fire floor overhauling, hitting hot spots, and wet down the areas still smoking. Members returned home around 830 pm. A few Passaic fire photos are also shown below courtesy of BNN.